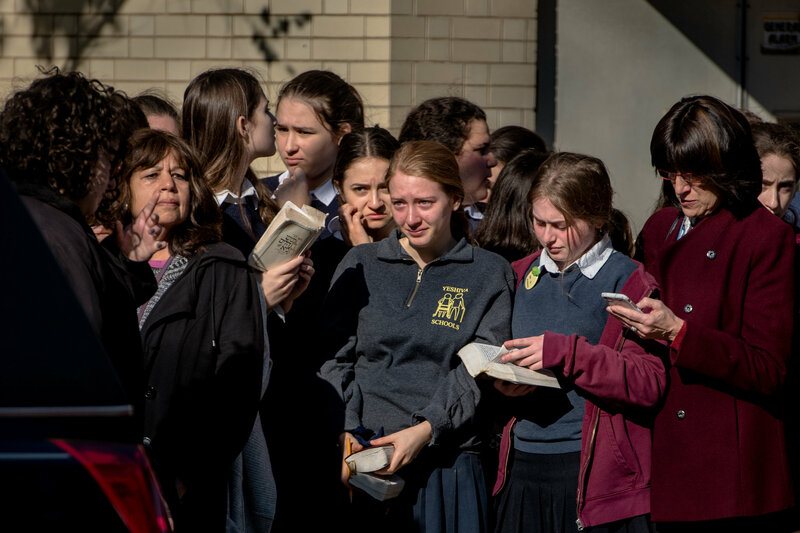 IN THIS PHOTO by Hilary Swift for the New York Times: Mourners gathered for Joyce Fienberg’s funeral in Pittsburgh on Wednesday. Story of the funeral here. 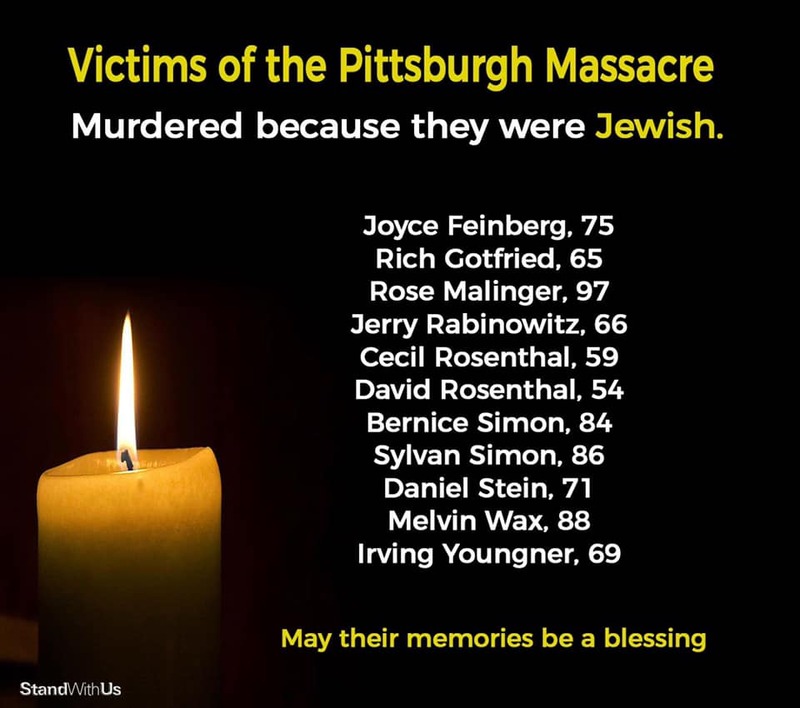 The president of The Union for Reform Judaism (URJ) noted in a statement — released shortly after the slayings at Pittsburgh’s The Tree of Life Synagogue Saturday — the terrible irony of the massacre. “The murders took place during a prayer service in the Tree of Life congregation where, like synagogues all around the world, they were reading from Genesis recounting how Abraham welcomed perfect strangers into his tent. This commandment appears 36 times — that’s thirty-six times — in the Torah. The commandment stems from the extravagant hospitality of Abraham, the first Jew. He literally ran out of his desert tent to bow down before three perfect strangers as they approached, showering them with God-like grace as told in Genesis 18:1-8. The Lord appeared to Abraham by the oaks of Mamre, as he sat at the entrance of his tent in the heat of the day. He looked up and saw three men standing near him. When he saw them, he ran from the tent entrance to meet them, and bowed down to the ground. Let me bring a little bread, that you may refresh yourselves, and after that you may pass on — since you have come to your servant. Abraham’s sense of urgency in making strangers feel at home stands out in bold relief. The story of Abraham is considered by many American Jews and Christians, myself included, as the clearest mandate we have in America, the richest and greatest nation in the world, to welcome aliens with our hands open in abundance, not closed like a fist in scarcity. And yet our U.S. government policy toward migrants from south of the U.S. border continues to run from harshly deceptive to downright evil. Go to this link to learn how the Trump Administration is putting legitimate asylum seekers in Catch-22 traps. The story of Abraham and others in the Older Testament aren’t the only ones that underscore our call as Christians to hospitality to aliens among us. According to his posts on social media, the man who attacked and killed 11 people and critically wounded others at a synagogue in Pittsburgh believed that Jews were the people behind the much-publicized caravan of Central American migrants fleeing violence in their homelands. I doubt that all those making the trek through Mexico, where many of them will stay, are angels. I have little doubt that a small percentage of those few thousand migrants have no intention of seeking asylum. But the notion that every one of the 3,500 men, women and children — all unarmed — are marching like an army to “invade” America is a sign of severe paranoia caused by the consumption of way too much toxic, political Kool-Aid. The very word invasion implies intent to conquer a country by occupying it and taking prisoners — and taking lives. Needless, draconian measures to defend against unarmed men, women and children fleeing violence and poverty in their native lands makes good politics for hack politicians. Tragically, it all makes for lousy Abrahamic hospitality.